Building an online community and giving your potential clients a possibility to view details about your business and its offerings on the go can be a great way of growing your customer base. If you are looking for a rock-solid solution to build your restaurant website, please consider this beautifully designed template. 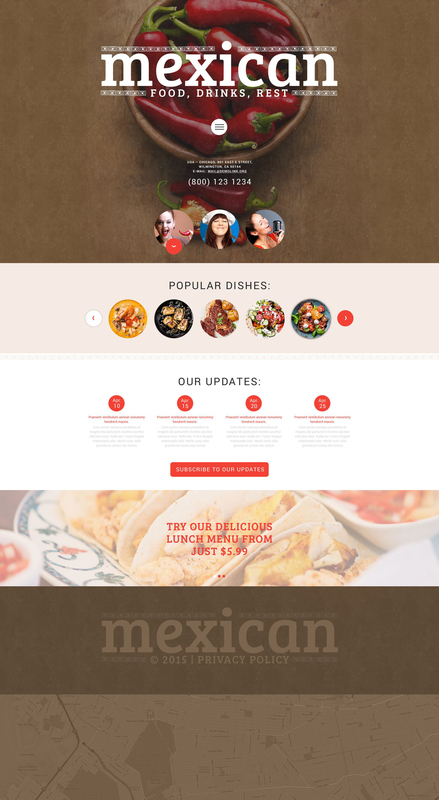 Mexican Food WordPress Theme features a mouthwatering design, which is so important for such projects. To save on space, a fly-out menu was added. By landing on such a web page, people should have no difficulty with coming across the desired information thanks to a though-out content structure. Vivid coral color is used not only to trigger appetite but also to capture users' attention. The theme is crossbrowser compatible, fully responsive and features every element you might need to build a competitive web resource. After Mexican Cafe WordPress design theme purchase you can put your copyright to the template. But you cannot place a line at the bottom (or any other spot) of the customized project saying "Website design by Company name". Nevertheless, you can place "Customized by Company name". If you purchase the product at a â€˜Unique price' it guarantees that you are the first and the last person to buy this WordPress theme for Cafe and Restaurant Supplies from us. It means that this template has not been sold before and you become an owner of a unique design. After this kind of purchase the template is being permanently removed from our sales directory and is never available to other customers again. The unique purchase license allows you to develop the unlimited number of projects based on this template, but the template should be customized differently for every project. If you purchase the product at a â€˜Buyout price' it guarantees that you are the last person to buy this template from us. It means that this WordPress design theme for Mexican Buffet may have been sold before a couple of times (see â€˜Downloads' number in item's properties) but only you and people who bought the template before you will own it. After this kind of purchase the template is being permanently removed from our sales directory and is never available to other customers again. The buyout purchase license allows you to develop the unlimited number of projects based on this template, but the template should be customized differently for every project. I really enjoyed working with this theme. To be honest it&#039;s beautiful as delivered with all the dummy content. If I could have left it like that I would have! However it was easy to change and really creates a brilliant image for the business concerned. Unlike so many themes, the design style flows through all the pages which makes the blog section look really great. We&#039;re using this template with WooCommerce and there was a little conflict with jquery which we needed to get some outside assistance to fix but once done all was good so just a word of warning if you&#039;re planning on adding an e-comm solution to the template - maybe Woo is not the best route! hi, kindly clarify: 1. how many stock photos are part of this deal? 2. what is meant by buyout price?